I always prefer mountains over beaches and I had never been to North East. It was a long-standing dream to visit this mountainous state, especially after reading about it on several blogs. Sikkim is a border state in North-East India and is flanked by Nepal to its Northwest, Bhutan to its East and Tibet to its North East. As it is located in the Himalayan mountains, we decided to travel in summer as most of the places will be unreachable due to snowfall in winter. Being a border state, the Indian Army has a very large presence and permits and restrictions to visit certain areas abound. One has to get all the permits in advance to avoid delays and cancellations. We had to replan 3 days of our itinerary and decided to travel to Darjeeling after exploring East Sikkim. What initially was planned to be a Sikkim trip turned out to be Sikkim-West Bengal trip. Though disappointed, we wanted to make the most of this trip. By the sprawling tea estates, magnificent hills on one side, river Teesta flowing on the other and wading through the ghats we reached Gangtok. On our way we saw this magnificent bridge called Coronation Bridge, built across river Teesta, during the colonial rule. The following morning, we were all set to drive to Nathu La, at the Indo-China border. Located at an elevation of 14216 feet, Nathu La was the fourth Himalayan mountain pass I visited. A special visit permit is required which can be obtained in Gangtok. Visitors are advised to carry a photo identity and 2 photographs for the permit. Authorised travel agents organize the permit as well as the transportation. Do note that Nathula Pass is closed for visitors on Mondays and Tuesdays. It’s good to start your trip to Nathula Pass by 8AM. Delaying beyond that is not advisable, as the single lane road leading to the pass is narrow, resulting in traffic jam; one cannot predict how the weather conditions change. One moment it’s cloudy, the next moment it starts raining and before you know the sky is clear again, offering a breathtaking view of the Himalayas. The 55 km drive will take about 4 hours one way. Only SUVs can negotiate the hilly terrain. Vehicles are allowed to pass the checkpoint only until 2:30PM. From my experience, visiting different Himalayan mountain passes, I can proudly say the drivers you find in these regions are best in class, highly skilled and experienced, getting past hair-pin bends, jostling for space, slippery roads, fog, bad weather or cloud bursts, nothing stops them. While we city dwellers don’t dare look down a cliff these heroes make it a smooth run. We just have to trust our lives with them for journeys like these remain alive for a lifetime. When you still have a few kilometers to reach the pass, drivers make a quick stop for lunch. If you aren’t well insulated, you can hire boots, jackets and gloves from the shops and taste some yummy momos, maggie noodles and piping hot tea they offer. With the weather changing rapidly, and poor visibility we were just lucky the roads were not blocked and we reached the pass around 3PM. To reach the actual border, visitors would need to climb few steps. The climb at that altitude can be really tiring. Gasping for breath we reached the border, which is just a thin line of fencing which anyone can jump to get to the other side. The border area has Indian and Chinese Army Quarters on either sides. Many of our brave army soldiers were present there, helping and leading the tourists, making sure no one clicks a picture near the border as photography is prohibited for obvious security reasons. Every time I make it a point to talk to them. I spoke to a soldier standing under an umbrella as it had started to drizzle by then, I asked him what the temperature might be and he told me it was -4 degree celsius, I was talking with my teeth chattering and he was standing there as if the weather didn’t affect him. I also asked him how the atmosphere there generally is and he told me it’s mostly peaceful. Thanked him for his service before taking his leave, the least I could do to show my respect to him and many other soldiers who make the supreme sacrifice to protect us. After spending a good 30 mins at the pass, we commenced our return journey. 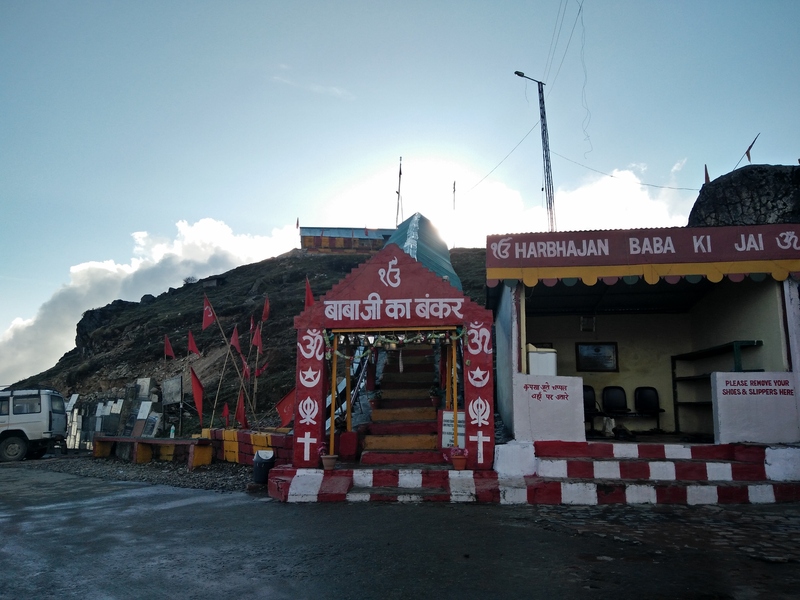 On our way back, we made a quick stop at Baba Harbajan Singh shrine. The shrine has an interesting story behind. En route to Baba Mandir, one can see a natural lake in the shape of an elephant called Elephant Chu, where Chu translates to lake. Our driver told us the trunk shape of the lake faces Bhutan and the hind legs face India. The region around this lake is used for firing practice by the Indian army. It was time to start our descend and one last stop before reaching Gangtok was Tsomgo Lake which is also called as Changu Lake. This serene lake is situated at an altitude of 12,400 feet and remains frozen in winter. The oval-shaped lake is considered sacred by the locals. Day 3 in Gangtok was for local sightseeing. No trip is complete without savouring the local delicacies and experiencing the local culture. As Sikkim is a mountainous state everything is built atop a hill. We visited Ganesh Tok and Hanuman Tok, temples of Lord Ganesha and Hanuman respectively, maintained by the Indian Army. Ganesh Tok offers a bird’s eye view of the entire Gangtok whereas Hanuman Tok gives a good view of Mount Kanchenjunga and the surrounding valley. However, the weather Gods were not kind enough for it was too foggy to get a glimpse of Kanchenjunga. Other places visited in Gangtok were Gonjang Monastry, Ridge Park & Flower Exhibition Center, Cottage industry and handicraft center – where we could see Sikkim’s famous Lepcha weaving. Had a little conversation with the artist at work, who was weaving a table mat, told me it takes 15 days to finish. Another must visit place in Gangtok is MG Marg – the pedestrian only zone which might approximately be a 1 km stretch is not just vehicle free but also smoke and litter free. Adorned by numerous restaurants, bars, shopping centers, and banks on either lanes and Victorian lamps along the middle of the road, it is ideal to take leisure stroll, sit and relax or do your souvenir and general shopping. If you walk a few steps downhill you reach another market called Lal Market, where one can find everyday needs. From Lal Market we walked back to our hotel to get a good night’s rest before leaving for Kalimpong the next morning. Sikkim definitely needs another visit to cover all the beautiful places I missed this time. Hope I get there one more time soon. Lovely photos and good prose. I am now following you!